If you are a GIS Analyst or especially if you are a GIS Administrator, you owe it to yourself to learn more about Voyager GIS. It is one of the most innovative and useful tools I have seen come on the market in the past few years from one of the best minds in the industry. During Jack's plenary presentation, he updated the software road map and release schedule for the ESRI product suite. Of significance, there will be a "9.3.1" release scheduled for the May 2009 time frame. The "9.4" release will hopefully be in beta sometime in late summer. From what I could read through the tea leaves, 9.3.1 seems to be focused on security and performance enhancements for ArcGIS Server. The 9.4 release will be a significant release and will contain the major enhancements to 3D geometry that I have been hoping for. ArcGIS Explorer build 900 is scheduled for release coincident with 9.3.1. Bernie Szukalski demo on the plenary stage. Bernie is one of my favorite people in the world just for openers. He is a superb human being with a tremendous and very human imagination. He is a magnificent story teller and gives as good a demo as anyone I have ever seen. On Wednesday, Bernie was showing off the capabilities of the upcoming ArcGIS Explorer build 900. It is a truly game-changing piece of work. The whole interface has been reworked to make it much more usable. (Hopefully stability and performance will have been addressed as well, but that is impossible to assess through a demo) Some great new features have been added including a presentation feature that allows you to create powerpoint like map based presentations. Another excellent addition includes the ability to create layer packages that package up data, cartography, spatial extents, etc. to send along to others. John Caulkins' demo focused on a concept he called "FedStat". This is not a product at all, but rather a web application design concept that delivers to executive decision makers dynamic cartography, analysis, integrated charting and graphics, and reporting in a way that allows the decision makers to focus on the relationship of key variables of a particular issue in a highly interactive and intuitive interface. The demo was interesting to me as much for what it did NOT contain as anything else. For one thing, there was no ground-breaking new technology highlighted other than creative use of Flash/FLEX in the design of the user interface. Nor was the story line particularly exciting. Lets face it, rusting bridges in Minnesota is not as exciting as predicting the locations of nuclear processing facilities in Iran like the Natanz demo. But the thoughtful and creative development of an attractive, intuitive, and highly interactive web application interface implemented in Flash/FLEX was extremely compelling. At this conference, we announced the availability of our In-Vision Portal product. This web application viewer product is designed to be the query, visualization, and reporting capability for a cross-functional Facilities Information Infrastructure. Built on ArcGIS Server with a Flash/FLEX interface, the solution allows users to quickly and easily understand various different facets of their buildings. We have very consciously built this system on a service oriented architecture to enable this viewer to "spatially enable" your existing enterprise information systems related to buildings. We demonstrated this new product to a wide range of potential customers and partners at the FedUC and were very encouraged by the reactions that we received. People seemed to immediately understand the value that this product could deliver to their organization particularly if it were integrated with their particular buildings information system whether that is a real property inventory, work order management, public safety, or space management. On Thursday morning, Sylvia Kendra of Smithsonian and Kenton Williams from PenBay presented a paper on a project that we did with Smithsonian to create a Facilities GIS for the Smithsonian Tropical Research Institute. You can find their presentation here and their submitted paper here. On Thursday afternoon, I had the privilege of speaking on a panel with Don Keuhne from ESRI and Eric Maxfield from Archibus on the concepts and technologies required to integrate CAD, BIM, and GIS and the basic concepts required to implement a Facilities Information System. You can find my annotated presentation here. The FedUC social this year was held at the convention center. Unlike previous years where the venue has been the Library of Congress, the Organization of American States building, or the National Geographic Society, this year's social reflected the economic downturn. Attendance to the social was significantly reduced compared to other years I have attended largely because of the venue I suspect. That said, it was a great time for networking and I had a number of great conversations with ESRI staff and with other industry players. All in all, the conference was exceptionally good for us. I think that we made more progress on various business development initiatives in the three days at the conference than in the previous three months. I was very encouraged about the response to our new In-Vision Portal product and am feeling very upbeat about opportunities in the coming months. If you were also in attendance at the conference, please add your experience in the blog comments. What is a Facilities Information Infrastructure? A Facilities Information Infrastructure is essentially an SDI for facilities. We take the same basic concepts that are delivering great value to us in the landscape and apply those concepts inside buildings. One of the great things about my job is that I get to meet fascinating people in my travels. Last week, I was in Boise starting a project for the Bureau of Reclamation with our project partner Premier Data Services. We were very fortunate to have Bob Johnson, Premier's President, on site for our first round of client meetings. Bob is an expert in western lands cadastre. He knows more about the subject than anyone I have ever met. A lot more. He has amassed this knowledge through a fascinating career working first in geology and then primarily in the world of lands records. His understanding of western lands records is greatly enriched by his love of geology and history and a passion for data. The passion for data he has turned into a strong business. Premier Data Services not only provides one of the most comprehensive query and reporting systems for western land records, they also have an extraordinary data production capability. When Hurricane Ike hit Texas in 2008, Premier was asked to assist in the damage assessment. They conflated the parcels in the impacted area (about 2.5 Million parcels in nine counties in three states) into a single geodatabase in order to create the data to support the damage assessment. And they did all this in about 10 days. Like I said... extraordinary. What I found most remarkable about Bob, however was not his detailed understanding of land records, but rather the story of our relationship with the western landscape that he sees in those records. There are patterns in the records that tell the story of how the country became more sophisticated in how it reserved water and mineral rights for the country as settlements moved west. There is the story of how land managers used access to land to encourage the railroads to build the rail infrastructure that allowed for development. There is the painful story of how we systematically displaced the native inhabitants from any land that the white man saw as valuable. And there is the story of how the Bureau of Reclamation used the power of eminent domain to create some of the world's most amazing civil engineering projects to water and power the west. Hearing these stories and the patterns of how the oil, gas, coal, and mineral industries have variously boomed and busted across the landscape was a wonderful experience. You can bet that the next time I have the chance to spend time with Bob Johnson that I will budget for more time and more beer. Point, Learn, Explore: with the iPointer 3D Mobile Search and Content delivery platform. Imagine walking through a city and seeing an interesting landmark or historic site. You take out your cell phone and point it at that landmark or a restaurant or shop (like a TV remote for the real world). Your cell phone shows you pictures, provides an overview of the site, along with reviews or the menu for the restaurant and a description of today’s special. This is possible with iST’s iPointer “pointing based” mobile search and content delivery platform. The iPointer mobile search and content delivery platform is network and carrier agnostic and will run on any mobile communication devices with a GPS, Digital Compass and a wireless data connection. Our customers benefit from the dynamic content retrieval and update capabilities of our Web-based geospatial search engine and content delivery architecture. When a user points their iPointer enabled cell phone at a landmark of interest, such as retailer, restaurant, or historic site, and presses a button, the coordinates from the phone's GPS and directional angles from the Digital Compass are sent over the data network to our Web-based geospatial search engine. Our algorithms turn the latitude and longitude plus compass angle into a directional vector, which is used to decide the single most likely landmark the user pointed to. Once this is decided, which takes only milliseconds, content, such as pictures, menus, and audio overviews about the landmark is streamed back to the user's phone. The iPointer doesn't need to use RFID tags or beacons in the buildings to work. Instead all we need is to use the map data that already exists and is used by car navigation systems and Internet maps like Google Maps. In fact one of the largest map providers on the planet wants to partner with us because our franchise model will help to maintain and validate their data-set. Theck out this video showcasing our system being used in NYC. The core of our intellectual property and product is focused on dealing with the accuracy issue, since metropolitan cities have an impact on GPS accuracy, with urban canyons creating multi-path errors. However, more geographic data is available for these areas and the data are more robust and accurate, including 3D data. Our system works quite well in metropolitan cites and is highly accurate. I have used it while standing very close to buildings as well as being several blocks away. Our product uses a probabilistic approach based on the perspective view of the user to select the most likely object pointed at. Using an approach based on the 3D perspective of the user significantly improves the performance and level of accuracy when dealing with high rise buildings in metropolitan cities. The need for 3D building structures is only necessary in metropolitan areas. In suburban and rural areas we can use standard 2D and even point geographic data. Our product is like a multi-player game engine that uses many types of geographic data including 3D data. Nine times out of ten, we end up choosing Adobe FLEX for the presentation tier. Why? Will 2009 be a transition year for location based services? If location based online apps are to transition from early adopters to mainstream, what kinds of changes do we need to see in data, platform and usability? In a recent article for Vodafone, Sean Gorman discusses Metcalf's law which states that the value of a network is roughly equal to the square of the number of users. He goes on to draw the conclusion that the amount of user-created spatial data has grown rapidly to the point where its inherent value will drive an explosion of active on line location users much like we have seen an explosion in social networking users in the past couple of years. Certainly the availability of location-aware data has grown dramatically in the past few years... but is data availability enough to drive a sea change? The past few years have seen the launch of a whole host of Web 2.0 companies trying to capitalize on the social value of place. Cladio Schapsis recently published a pretty impressive list of such services. 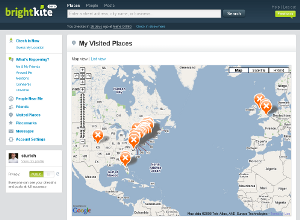 I use BrightKite, Dopplr, and WorldMate live and love them, but I am a classic early adopter geek. The problem with these services is that they are not aware of your location until you specifically update your location through some sort of "check-in" process. While many web apps have reasonably usable check-in processes, we have still not gotten to the point where the combination of your mobile device and your LBS platform are inherently aware of your location at all times. Until we have this level of constant awareness of your location, use of location enabled social or commercial platforms will not take off. Room for a new mobile application. One of the biggest game changing technology releases in 2008 was the App Store by Apple for the iPhone. This brilliant (and highly uncharacteristic) move by Apple motivated Android and Blackberry to follow suit with stores for mobile applications for their platforms. Now developers have a much more direct path to market for mobile applications. My hope is that some bright young developer will recognize the potential represented by constant awareness of location and create a suite of mobile applications that will automatically update my location on Firebird every few minutes (or hours) without any action on my part. When the platform can be aware of our location without our active involvement then we will be poised to realise the full promise that location based services offers. 1. Learn an object-oriented programming language. I try to be technology agnostic. The choice of platform should really be determined by the organization that you wish to work for and what you want to really achieve with your programming skills. Each organization has its own IT preferences and truthfully the differences in capabilities of the different platforms are in the margins. Learning the concepts of object-oriented programming, however, is a must for any good developer. Pick your platform - Java or C# and learn the fundamentals of object-oriented programming. 2. Learn how to develop for a 3-tier web architecture. 3. Learn what coordinate systems are and how to use them. The concept is simple - we live in a roundish world and we make flat maps. Coordinate systems help us to resolve the whole round to flat thing. The implementation is anything but simple. There are thousands of different coordinate systems that have been developed over the centuries each optimized for linear distance or area in a particular part of the world or for the whole world. You need to understand the basics of coordinate systems to be a successful GIS developer. Period. 4. Apply what you have learned to real-world problems. This is what seperates the wheat from the chaff. This is also where I belive most Universities are failing their students. Being able to repeat coding patterns from text book examples does not make effective developers. Effective developers create solutions that people use to solve real-world problems. In the hiring process, this is where the real stars stand out. When I am interviewing developers, I am only marginally interested in the school that a candidate attended or the grades received. What I AM looking for is practical experience. I am looking for developers that can demonstrate their ability to listen to users, to understand their problems, and then design, develop, and deploy solutions that help solve those problems. I am a big believer in learning by doing. If you want to become a GIS developer, start developing solutions. Start small and build up. Each time you do something new you will learn something new. As you develop more, and more interesting applications you will simultaneously be building a portfolio that will be your biggest help in landing a new job or a more interesting job in your current organization. I have the priviledge of sitting on the Maine Geolibrary Board for the great state of Maine. We meet once each month to discuss State spending priorities for GIS investments. Maine is a highly rural state with only about 2 million people mostly clustered along the coast and major rivers which means that we don't have a large populace that would generate much in the way of taxes that could be spend on infrastructure like GIS. An additional complication is that in Maine we have not figured out the economies of scale that counties represent and so any GIS data development effort is REALLY local. All that said, the GIS data and delivery systems provided by the State of Maine to its people, businesses, and government agancies represent a tremendous value. Don't they? In the US, we have a wonderful tradition of making government-developed spatial data available for free to citizens, business, and public agencies. This policy delivers a huge amount of value to all of us each year. Unfortunately, the real value that is returned from that investment is seldom analyzed or modeled. I know of few, if any, studies that have been done to estimate the value of public investment in GIS data and systems and this creates real problems for those charged with the stewardship of these efforts. As an industry, we need to do a much better job of documenting the value of geospatial technology and communicating that value to our public leaders. People take for granted that when they dial 911 the fire fighters will respond to the right house, that they are being taxed on the right piece of property, and that MapQuest will route them properly to their house. All of these capabilities benefit in some way from public investment in geospatial systems. I wish I knew a good economist that could help me the value these systems represent to society. If you know of any good economics studies that demonstrate the value of public investments in geospatial systems, please post a comment. Without a doubt the technology with the biggest WOW factor that I saw at the ESRI Europe show in London was the 360 degree camera from Spheron. The quality of the image that is produced by the platform is truly stunning. The system delivers with a custom tripod for taking offset images that allow for parallax measurement in their custom software package. As with many solutions, the real magic is in the software. The system that they have developed is elegant, delivering the ability not only to measure distances on the images, but also to tag the images with attributes and therefore link to a document management system or other database systems. The implications of this system to architects for creating an assessment of existing conditions in high-end or complex spaces would be hard to over-estimate. Unlike other 3D laser approaches, this solution gives you an incredibly rich photographic detail of every part of the space. The details of the space that can be visually interpreted go far beyond the basic surfaces available from a laser point cloud. Imagine being able to revisit each room in a building as often as you wish to remind you of finish detail, light switch placement, furnishings, etc. If you are an architect that works in interesting buildings, you have to check these guys out! I have been talking with a number of people lately about the use of in-building GIS for security management. Turns out GIS offers a lot to the security professional both inside buildings and in the landscape. One of the fundemental analogies in the security world is the layers of the onion. The item that you are trying to protect is the center of the onion and there are a number of progressively restrictive layers of monitoring and access control established between the outside world and your target. Take Heathrow airport for example. The monitoring starts as you leave the M-25 as a series of video cameras scans your license plate looking for matches with criminal activity. The monitoring and access control becomes progressively tighter as you finally move through the final security screening and are permitted "air side". The interesting point here from my perspective is that the security infrastructure is both internal and external to buildings and therefore to properly model your security infrastructure in GIS, your GIS needs to go into and throughout buildings along with the security problem space. GIS dashboard for security monitor status - quickly show all monitors on a map (both inside and outside) with the status of each monitor. Be able to select individual video cameras for immediate detailed display. Mobile GIS for planning and inspection - download your GIS (both inside and outside) to a mobile device to support security planning and inspection workflows in the field. Spatial Analysis for Security - surfaces that describe concentration of vulnerability or threat, 3D explosive arcs, placement of security cordons. Viewshed Analysis - If I can deploy 5 sharpshooters, what are the optimum placements so that they can cover the most critical landscape? As the 3D capabilities of GIS are enhanced in future releases, there will be ever more compelling reasons to leverage the power of GIS in security operations. How can your organization benefit from incorporating GIS into its security system? This week I was invited to be part of a panel discussion on in-building GIS at the ESRI Installations and Environment User Group meeting in Washington DC. it was a very interesting event to be part of as many of the best minds in the Dept. of Defense were there. These are the folks who run our nation's facilities GIS implementations. When you stop to consider the number and value of the installations owned and managed by DoD, the numbers are truly impressive. GIS for facilities is very mature at DoD and most of the services are actively using GIS for activities as diverse as pavement management, housing allocation, energy management and noise abatement. The #1 topic on everyone's agenda at this event? Space Management. Turns out the "footprint reduction" is an important directive for all the services and they are struggling to come up with plans that will reduce the space that they occupy by 15% by 2011. This would be an extraordinary challenge under any conditions, but one of the big problems that all services are struggling with is that the data to make consolidation decisions is either missing entirely, out of date, or developed to inconsistent standards making analysis impossible. Hence there is a BIG focus now on developing standards for floor space data collection and maintenance standards. Each of the services seems to be pursuing their own path currently as SDS FIE does not speak very clearly on the subject of floor space. There is supposedly an overhaul of SDS FIE due out soon, but there was no information available at the conference about whether there would be a more thorough treatment of floor space in the new standard. BISDM anyone? I attended the ESRI EMEA conference this past week in London. To give you a sense of the size of the conference, there were about 1,600 in attendance from Europe, Middle East and Africa, with about 50 vendors with displays in the exhibit hall. The venue was the QE2 conference center in Westminster Square which is a terrific location in London even if the conference center space itself was a bit disjointed and smallish for the size of the conference. Just being in this part of London was a highlight in itself. This was my first time at this particular conference, and I was unsure what to expect. I was not disappointed. There was lots of traffic at the booth during session breaks and the conference attendees were a very educated and focused lot. I always enjoy getting out of the States whenever I can to get a broader perspective, and this was a great opportunity to get a more global view of the GIS world through conversations with other users and GIS professionals from Europe, Middle East, and Africa. 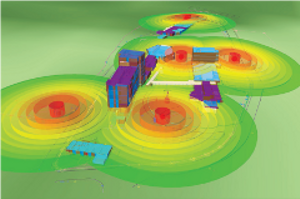 GIS for Facilities Management is really gaining momentum. This is a trend that I have noticed (and tried hard to push) in the States, but I was heartened to see the strength of the trend in Europe as well. I attended one presentation on the integration of BIM with GIS (there wasn't actually much pertinent information on BIM but that is not really the point) and the attendees were standing in the back and spilling out into the hallway. The GIS community is hungry to understand what BIM really means and how we interoperate with buildings in a GIS environment. This impression was strengthened by many conversations that we had at the booth where people were trying to figure out how they could extend their GIS operations to concerns inside buildings. GIS is embracing 3D. Or at least GIS users desperately want to embrace 3D for a wide variety of uses and workflows, many of them involving buildings. ESRI seems to have really gotten the message that 3D is critically important and are investing in 3D development. David Maguire was pretty direct in describing an emerging trend toward 3D at ESRI in his remarks on the opening day. While I am very encouraged by the desire and the direction, I also understand that the level of expectations from users is very high and we have a VERY long way to go to deliver practical and usable 3D capabilities in ESRI GIS. Carbon management is a BIG deal in Europe. One of the strongest impressions that I was left with from the conference is how seriously the issue of climate change is regarded in Europe. While this issue was less important to attendees from the Middle East and Africa, the Europeans are very serious indeed about global climate change and are taking strong actions to deal with it. Both government and commercial sectors are taking significant actions to combat global warming. There are significant investments in green energy being made and energy conservation is taken very seriously. As one small example, the Manchester Airport Authority has stated that it will be "carbon neutral" by 2015 and is investing in a wide variety of programs to get there. I left with the sense that the Europeans are at least a decade ahead of us on this issue and we falling further behind every day. If we don't see a significant change in attidude in the States on this issue soon, we will find ourselves far behind the Europeans in the green revolution even as the value of our own greenbacks become increasingly irrelevant on the global financial stage. We have also been working hard to develop a suite of data collection and delivery products for in-building data. We believe that there is great potential in leveraging the power of GIS to 'spatially enable' existing enterprise systems for facilities management, real estate capital planning, portfolio management, work order management, environmental monitoring and many other types of systems related to buildings. GIS brings the great power of spatial analysis to buildings and facilities problems and is capable of doing this in a real-world spatial reference so that the buildings can be understood as proper participants in the surrounding landscape. GIS brings us the power to do very practical queries such as "show me all of the vacant offices within 500 ft. of a parking lot", or "show me which portions of my library are not within 75ft. of a fire extinguisher" or find me the shortest path between Room 315 in Barrows Hall and my dorm room if I am wheel chair bound. GIS also represents great value as a technology to spatially enable Computer Aided Facilities Management (CAFM) systems, Work Order Management systems, and other enterprise applications. One challenge for GIS for buildings, however, is representing the vertical nature of buildings. Buildings are often complex spaces in three dimensions and urban environments are especially so. In order to really understand how the space within our buildings relates to the surrounding environment, we really need to be able to analyze and visualize buildings in 3D. Lately, many of the conversations I have been having with customers and partners about geospatial representations of buildings seem to migrate very quickly to discussions about the desire to represent the building in 3D. Often these conversations quickly deteriorate into evangelistic diatribes about whether CAD, GIS, or BIM (and your particular flavor of each) are the one basket into which we should put all our eggs. I think a more healthy approach is to try to more clearly describe the various reasons that would want to represent a building in 3D in the first place, what particular analysis do we want to perform, and how much value that representation would have to us (how much are you willing to pay for 3D?). Perhaps then we will be better able to choose the combination of technical tools and platforms that can best deliver what we need. government, educational institutions, large commercial businesses or property management firms. Their primary interest is in how space is being used across their holdings. For this type of person, a simple "jello cube" visualization analysis and some GIS Analysis can offer good value. The space manager can symbolize space by various criteria and view the results across the campus (or the region, or the world). This type of visualization can be very effective for re-stack analysis, space planning, and understanding the potential impact of proposed construction. Real Estate Property Managers: Real estate property managers have many of the concerns of space managers, but they have the added requirement of providing the ability to see the internal view of the space as a way of enticing new customers to invest in new properties or to move to new rental spaces. Building very realistic 3D visualizations of the insides of buildings can be an expensive proposition. There are companies like FatWax that are really defining the high end of this kind of visualization. This approach is particularly good for buildings that are in the midst of the design/construction process. Often new projects require that a certain number of units must be sold before financing can be obtained. These virtual renderings can be a good way to generate demand and are particularly well suited to new buildings or buildings that have not even been built yet. These animations are not particularly suitable for analysis, however, and would not scale to an entire building much less for a city neighborhood. An alternative to this approach for buildings that HAVE already been built is to move through the space with a 3D camera such as those from Immersive Media or GigaPan. The media captured from these cameras can then be linked to a specific location in your floor plan in your BIM or GIS viewer so that a user can see a high quality view of the space at the time the imagery was captured. Facility Managers: Facility Managers are the folks that do all the hard work to keep our buildings operating effeciently. They are responsible for the 80% of the costs of a building's life cycle related to operations and maintenance (O&M). These folks have some pretty detailed requirements related to the buildings under their stewardship. They need to be able to measure roof area for instance to plan for their replacement in their capital plans. They need to be able to locate all significant pieces of equipment (air handlers, pumps, fire suppression systems, security systems, etc.) that will require active maintenance along with enough relevant information to tie back to their Work Order Management system. They would like to be able to measure the area of walls to price wall covering or painting contracts. They would like to be able to select all south facing glazing on a building and calculate its area for instance to calculate the cost efficiency of installing low-e glazing. In theory, this is the kind of problem that BIM was designed to help with, and for new construction it can be a big help. In reality, the VAST majority of our current buildings inventory is older than three years (an age when we might expect to have a BIM for a new building). It is highly unlikely that we are going to invest in developing BIMs for many of our existing buildings. A much simpler approach leveraging GIS would be an attractive alternative but as of this writing GIS does not offer any practical support for vertical objects (lines or polygons) so we are left with a frustrating lack of cost-effective alternatives. Architects: Architects, particularly those designing renovations to existing buildings have a wide range of requirements. In the early stages of a project, they have a need for rough planning-level data to allow them to work through design alternatives. Photos and video located to a specific point on the floor plan can also be very useful in evaluating building systems dependencies. Eventually they may need to create a full BIM of the project to resolve all the construction details. We have developed some new automated data capture capabilities that dramatically shorten the time required to collect in-building data. We generally use free GIS tools and web applications to deliver the combination of GIS, CAD, and BIM data along with a variety of media formats. This combination of formats can give an architect an important head start in developing their project BIM. Landscape Planners: For landscape planners, whether at the campus, municipal, or regional level, an understanding of how proposed building development activities will impact the visual aesthetic of a neighborhood is a critical requirement. This is an area where huge progress is being made in the ability to collect, manage, distribute and visualize 3D buildings. Google brought this concept into our mainstream conciousness recently with their 3D Buildings project promoting the use of their Sketchup tool. KML has since become a common exchange format for this type of visualization. Paul Cote, professor at the Harvard School of Design has done some very interesting work with the CityGML group to take this concept and expand it to the rendering of larger geographic areas allowing for the ability to provide scalability, performance, and a greater degree of intelligence to the representations at a city-wide scale. So, what have I forgotten or mis-stated? How are you using CAD, GIS, or BIM in your world? What do you see as the future of these capabilities?